Select Page: 1. | 2. | 3. | 4. Johann Nepomuk Hummel was a contemporary of Beethoven, but unlike Beethoven he was able to study under Mozart. Hummel played a central role, both as pianist and composer, in the golden years of Viennese Classicism. Hummel's output is of fundamental importance for an understanding of how musical style evolved from Haydn and Mozart to the first Romantic composers; the musical route followed by Hummel represents an alternative to that followed by Beethoven. As well as the pure pleasure of listening, the works presented here also provide a valuable opportunity to evaluate the creative development of the composer, from his youthful beginings to his late maturity. 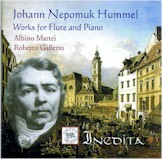 Performed by Albino Mattei, flute and Roberto Galletto, piano. The works are Grand Rondeau, Op. 126; Sonata, Op. 50; Sonata Op. 2, No. 2; and Sonata, Op. 64. 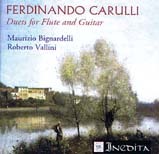 This CD contains two remarkable Duets for Flute and Guitar written by Ferdinando Carulli. The Six Duets, Op. 51, were written in 1813 and the three small Duets of Op. 191 are from 1823. There was a great deal of Hausmusik (instrumental salon music) being written in the late eighteenth and early nineteenth centuries that was uninfluenced by Viennese Classicism. A new programmatic aesthetics took the place of the old aristocratic experiments; the 'Sturm und Drang' and the 'Biedermeier' movements in Vienna and the German-speaking world were not part-and-parcel of the new aethetics as professed by the bourgeoisie in Paris and Naples, which was rising fast and needed a form of cultural self-assertion. Formost among the exponents of the new aestheticism was Ferdinando Carulli and these delightful pieces are wonderful examples of his instrumental salon music. They are beautifully performed by Maurizio Bignardelli (flute) and Roberto Vallini (guitar). Fredrich Kuhlau (1786-1832) was born into a musical family in Uelzen, near Hanover in 1786. He was quite a capable craftsman of the Biedermeier school and composed a large number of works in a wide range of genres. This Piano Concerto in C major, Op. 7 was composed in 1811. The opening Allegro has the same proud, almost military hue as Beethoven with its first clear chords on the main key. More influences of Mozart and Haydn can be found in the work as it unfolds. This lively vibrant work ranks with the finest piano concertos of this period. Franz Berwald (1796-1868) was born in Stockholm ten years after Kuhlau, but died many years after his German-born Danish colleague. Berwald was much less influenced by the spirit of Beethoven, whom he he saw as remote and intimidating. He was increasingly influenced by the styles of Spohr, Weber and, above all, Mendelssohn. The Concerto for Piano in D major breathes a soft, light air that is reminiscient of Mendelson. This Concerto, completed in 1855, remained largely unknown for many years and was first performed by the composer's grandaughter, Astrid, many years after the composer's death. Both concertos are stunningly performed by Maurizio Paciariello and the Sassari Symphony Orchestra under the able direction of Roberto Diem Tigani. 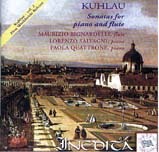 In 1826 Kuhlau published two great Sonatas for Piano and Flute, Opp. 69 and 71. The stylistic homogenity of these two works clearly appears through the formal structure. They are divided into three movements, the first is always an Allegro of large proportions, the second is a Cantabile with flute cadenzas, and the third is a brilliant Rondo. These were followed by a new group of Sonatas Concertanti, Op. 83. Number one is presented here. The stylistic model that Kuhlau followed for these sonatas was Beethoven's Variations on Folksongs Opp. 105 and 107. Kuhlau knew them very well. The great Sonata, Op. 83, No. 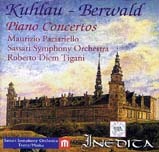 1 was modeled on an old popular Swedish song, but while Beethoven had assigned to the flute a role quite secondary compared with the piano, Kuhlau created a proper Duo concertante, since he was an accomplished flutist. Kuhlau's sonatas seemed to suit "the most advanced" and enjoyed great favor with flutists of the time. These sonatas are brilliantly performed by Maurizio Bignardelli on the flute and Lorenzo Salvagni and Paola Quattrone, pianists. 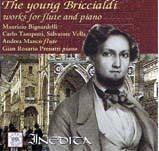 Close study of the flute works of Giulio Briccialdi (1818-1881) has brought to light several surprising discoveries. His best years as a concert performer were in his youth, when he 'played the Ziegler system flute, a period in which he earned well-deserved fame as a great flutist.' It is the use of flutes tuned down to a low A that makes it possible to achive the virtuoso performance and technically expressive effects that can be heard on this CD. This recording presents four works for flute and piano, all performed by Gian Rosario Presutti on the piano and accompanied by four different, but very talented flutists, Maurizio Bignardelli, Carlo Tamponi, Salvatore Vella, and Andrea Manco. The first two works, Fantasy, Op. 39 and Duo Concertante, Op. 33 are based on themes from works by Verdi, while the third work, a Fantasy for Flute and Piano is based on a theme from Bellini's La Sonnambula. A Concerto, Op. 19 completes the presentation. Briccialdi performed many of these works at his own recitals, and they became his 'trademarks' during the period in which he was establishing himself as a virtuoso musician throughout Italy and the rest of Europe. 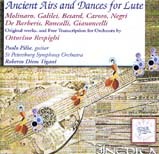 In addition to the very famous and popular set of Ancient Airs and Dances by Ottorino Respighi, this CD contains a remarkable collection of pieces by rarely heard masters such as Molinaro, Galilei, Negri, and Roncalli performed on the guitar. In choosing these neglected works Respighi became nothing other than a free poetic translator, an enemy of the literal and convinced that there is an artistic order that rises far above the passage of centuries. The refreshing brightness of these works is a truly rewarding listenig experience. The Respighi pieces were performed by the the St. Petersburg Symphony Orchestra under the direction of the distinguished conductor Roberto Diem Tigani. The other collection of airs and dances are beautifully rendered by Paolo Pilia on the guitar.